The MCP9804 digital temperature sensor converts temperatures between -40°C and +125°C to a digital word with ±1°C (max.) accuracy. The MCP9804 comes with user-programmable registers that provide flexibility for temperature sensing applications.The registers allow user-selectable settings such as Shutdown or low-power modes and the specification of temperature Event and Critical output boundaries. When the temperature changes beyond the specified boundary limits, the MCP9804 outputs an Event signal. The user has the option of setting the event output signal polarity as an active-low or active-high comparator output for thermostat operation, or as temperature event interrupt output for microprocessor-based systems. The event output can also be configured as a Critical temperature output. This sensor has an industry standard 2-wire, SMBus and Standard I2C™Compatible compatible (100kHz/400kHz bus clock) serial interface, allowing up to eight sensors to be controlled in a single serial bus. 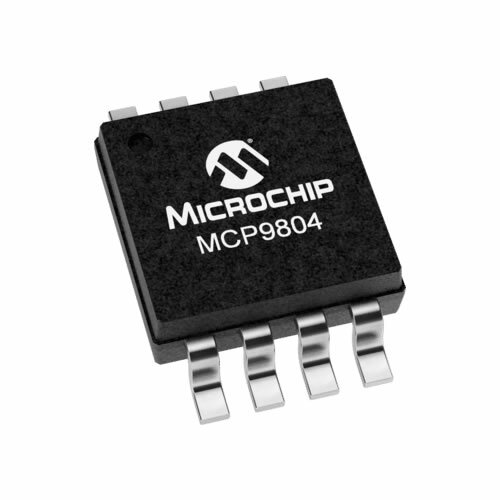 These features make the MCP9804 ideal for sophisticated multi-zone temperature- monitoring applications.